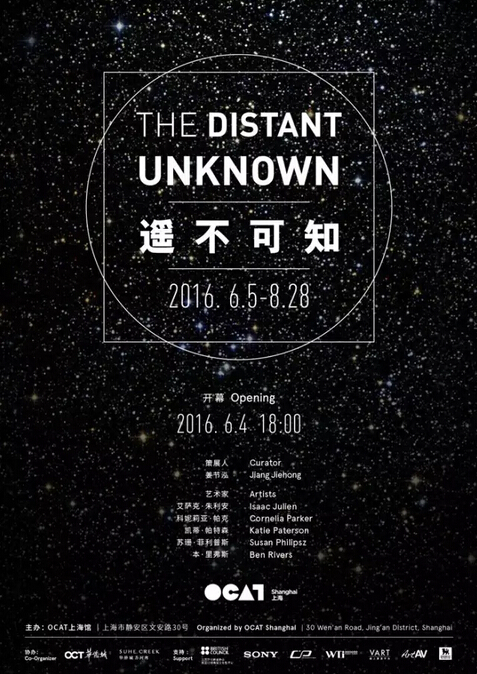 The Distant Unknown is an exhibition featuring contemporary artists from the UK. The curator Jiang Jiehong invites five British artists to initiate a dialogue that explores the notion and our understandings of ‘distance’ through video, photography, sculpture, sound and installations. In this exhibition, artists reassess the concept of ‘distance’ from a variety of perspectives. 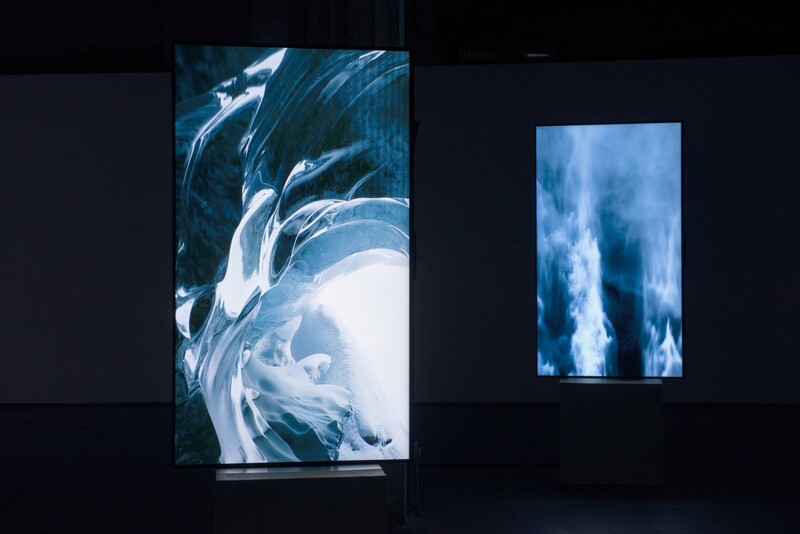 Isaac Julien’s five-screen installation that set up in the centre of the space, comments on the essence of creation and creativity to lead viewers into an unknown space. Cornelia Parker’s photography and cast copper sculptures chase down the ephemeral minor detailsof memory, life, and history that solidify these fleeting moments into apermanent, physical state. Katie Paterson manipulates two basic human sensesof sight and smell to unbind viewers from the reality of geography and allow them to voyage into outer space and experience the universe beyond the ordinary reaches of our spatial perception. Susan Philipsz investigates sound to sculpt an alternate form of occupying empty space. Finally, Ben Rivers’ film takes us into a ‘distant paradise’ and examines the intimate, everyday life of the South Pacific island nation of Vanuatu. With the main theme of The Distant Unknown, this exhibition illuminates how distance can induce intens esensory perceptions and disorientations. The idea of distance can be understood in terms of a ‘near or far dichotomy’, or as an intimate or expansive space. In the exhibition, the artworks invite us to reflect on these conceptual manifestations of distance from the geographical to the abstract, from the accessibleto the inaccessible, from the real to the imagined, and from time to space. Consequently, distance can also be considered in how it is able to create a sense of unknowing or unfamiliarity that ultimately compels viewers to contemplate on (and perhapsdoubt) our existence, interaction with, and place in the world. Rather than an introductory survey show, OCAT Shanghai is proud to present the first thematic exhibition of contemporary British art in Chinaby inviting five British artists to respond to the curatorial idea. The Distant Unknown aims to bridge Chinese audience and British art, which is no longer in the distance and unknown, and more importantly, to urge us to reflect the notion of ‘distance’ in our everyday life. 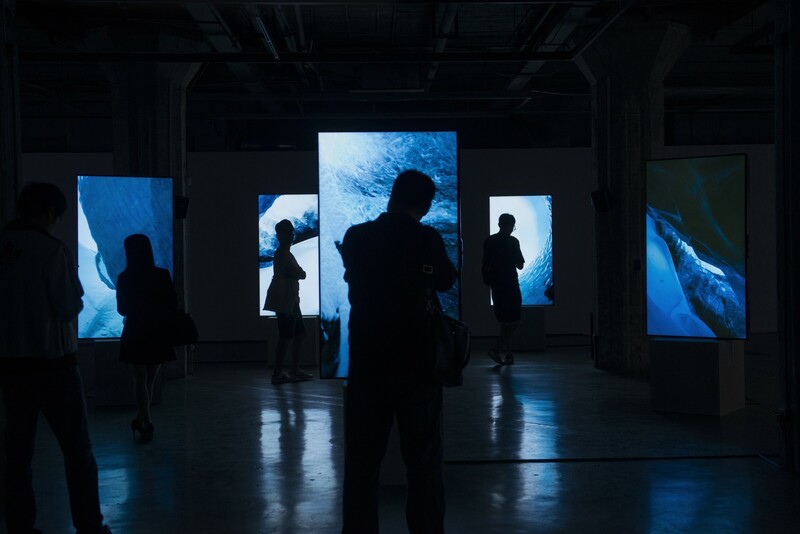 OCAT Shanghai wishes to express a special thanks to the British Council and Sony China Limited for their sponsorship and support towards this exhibition. Professor Jiang Jiehong is Head of Research, Birmingham School of Art and Director of Centre for Chinese Visual Arts at Birmingham City University. He has got extensive research and curatorial experiences in contemporary Chinese art and visual culture. His recent curatorial projects include the 4th Guangzhou Triennial: the Unseen (co-curated with Jonathan Watkins, 2012), the 3rd Asia Triennial Manchester: Harmonious Society (2014) and The Shadow Never Lies (co-curated with Mark Nash, Shanghai 21st Century Minsheng Art Museum, 2016). He is also editor of Burden or Legacy: from the Chinese Cultural Revolution to Contemporary Art (Hong Kong University Press, 2007), and author of The Revolution Continues: New Art from China (Saatchi Gallery and Random House, 2008), Red: China’s Cultural Revolution (Random House, Jonathan Cape, 2010) and An Era without Memory: Chinese Contemporary Photography on Urban Transformation (Thames and Hudson, 2015). Jiang will be Principal Editor of the Journal of Contemporary Chinese Art (Intellect) from 2017.